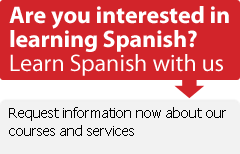 » Previous Article: Poll Results: Why Study Spanish? Soon after Easter I suddenly decided to go up to visit my son in Salamanca. What better thing to do than get myself booked in for a five day intensive course to boost my Spanish. I travelled by train to Madrid and by coach to Salamanca, a very comfortable journey on a Sunday. My brief was to report a the school on Monday morning at 8am for a level test. This happens every Monday morning with a new influx of students. It consisted of a written test and an oral test to assess the ability and level of each new student so that they can be slotted into the appropriate class. This took about one hour. At nine o'clock two teachers took the new week's students (around twenty people) on a guided cultural tour of the beautiful city of Salamanca which ended one and 3/4 hours later in the majestic Plaza Major. We then had just enough time for a nice Spanish coffee before lesson began at 11:15AM. We were three new students in a class of eight. Naturally we had to introduce ourselves to the teacher and the other students, only in Spanish of course. It was forbidden to speak another language.If anyone did they had to pay 1 euro. Wonderful practice for me, as I find it difficult to get much continous practice down here in Marbella where so many people speak English. For four mornings from 9AM to 1PM I spoke only Spanish and met some very interesting people from all over the world. In my class were two men from America, one lady from Canada, one from Germany, one from Sweden, one man from Switzerland, a man from from China and myself from England. We were of mixed ages, so not for one moment did anyone feel uncomfortable. The lady from Canada and I are going to e-mail each other in Spanish to continue an ongoing dialogue. Since arriving back in Marbella I have told some friends about my "Back to School" experience, and I think I already have persuaded one lady with her friend to try it out next spring. The teaching method in my opinion was second to none, and the idea of two different teachers during the morning kept everything very fresh and interesting. Given the chance I would certainly be happy to do it again. In the meantime I am continuing with my Spanish lessons on a one-to-one basis with a Spanish native.